Your opinion matters. Leave your review of Saint John's Hospice. Drug and alcohol-free, 40-bed emergency shelter / residence for men who are in transition from homelessness to independent living in the community; all residents meet with in-house case managers to work through specific issues associated with homelessness and are referred to appropriate treatment centers and skill development programs in the community. Drug and alcohol-free, 12-bed residence for medically fragile, homeless men; as with the above mentioned program, the Good Shepherd Program focuses on transition from homeless to independent living, while also working with its clients to manage their specific healthcare needs. 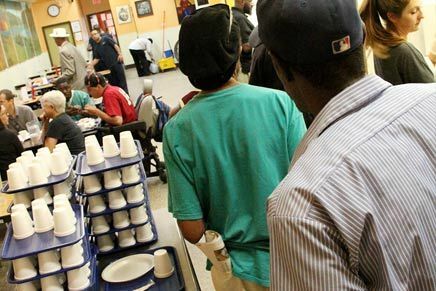 The Coffee House provides a safe resting and sleeping environment for 27 chronically homeless men who typically avoid shelter living. The men are provided a warm meal, beverages, and use of the SJH restrooms. The Coffee House guests are also able to take a shower in the morning before they leave for the day. The Coffee House operates from 10 pm to 6 am every day of the year. If you are interested in staying at the SJH Coffee House, report to at the corner of N. Camac and Race Streets at 10 pm. 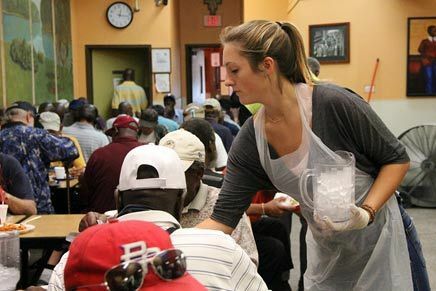 Day services for homeless men and men in need; Saint John’s provides a nutritious and hot noon meal for more than 325 men each weekday as well as case management services, on-site nursing services, daily showers and clothing, and a mailroom services for over 900 men. Weekly walk-in shower services are provided on Monday, Tuesday, Wednesday and Friday of every week, 8:30 am – 9:15 am, in basement of SJH. All patrons must be finished and leave by 11 am. Sign-up for a shower during lunch on the weekday before you want a shower. Look for staff with clip boards to register. Monday showers are reserved for seniors, disabled patrons, and veterans. Saturday 12 noon – 6 pm. Check mail at least once per week. No information about mail will be provided on the telephone. Proper photo identification or an official Saint John’s mail verification from (available from the day services case manager) is required to collect mail. Please note: the mailroom is open on 2nd Tuesday of the month when other day services are closed. Volunteers Requests by Saint John's Hospice: Please call or email. No unscheduled volunteers. Check website. Donation Requests by Saint John's Hospice: Men's underwear: tee shirts and shorts (L, XL, 2XL); athletic socks. Do you have items to donate? Contact Saint John's Hospice at the phone number provided above to see if they can use any items you may have to donate.